The cold, damp air hits you hard as you step out of the truck. Your favorite hunting companion eagerly awaiting his invitation to join you. You put on your waders still damp from the previous days hunt. You grab your gun, bag and turn to give the “OK” to your partner patiently waiting in the cab. He jumps to the ground quickly finding his spot beside your left leg. His full attention is on you. He know where your going but never leaves your side. You make your way to the blind, he climbs in his box. Patiently he waits, his eyes affixed on the sky’s above. Waiting, hoping for a chance to show off his unique abilities. The sound of his tail thumping the blind floor makes you smile. The thumping stops and the sound of whistling wings catches you off guard. He saw them before I did, you think to yourself. The sound of your call breaks the silence. There cupped, your ready, he’s motionless. With a well place shot your quarry falls belly up on the water. With just a whisper you set him free. Free to do what he was bred for, what he was trained for. At Flyway Labs, we make moments like this a reality. 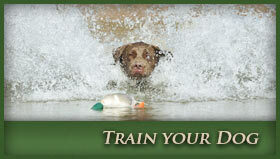 We specializes in training fine sporting companion dogs. 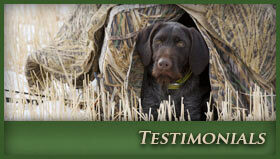 Whether you are a avid waterfowler, upland hunter or hunt test participant, we can develop your dog to the best of its ability. Our methods utilize a mixture of the newest techniques in canine behavioral science and old world English style training. Your dog is unique. 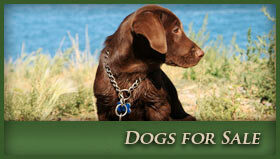 It’s genetics, socialization and physical makeup are different from even its litter mates. This uniqueness makes your dog special, one of a kind. Its training should be the same.